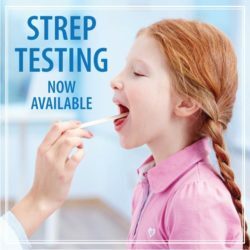 Strep Testing- No Appointment Needed! Our pharmacies have added a new service – rapid strep testing. If you think it can be strep, come see us today, no appointment needed. If the results are positive, we dispense treatment and care instructions at the same time, ensuring you’re on your way to feeling better quickly. Let us help get you in quickly, without exposure to other sick patients and without waiting for an appointment. Visit www.maceys.com to find a pharmacy near you.